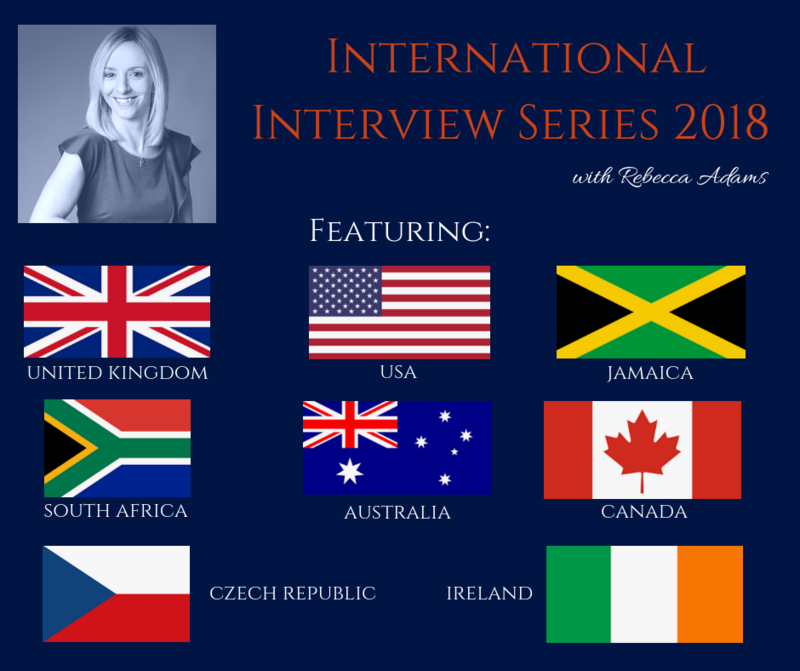 The International Interview Series 2018 by Rebecca Adams is here! This series is to really INSPIRE, MOTIVATE and EMPOWER you to STEP INTO YOUR POWER and ELEVATE you in both your life and business. Learn from 30 INCREDIBLE entrepreneurs (listed below), from all around the globe, who have done what you want to do or more in many professions. Let them show you how to UP YOUR GAME and really PLAY BIG to achieve the freedom and life that you desire for yourself and your family. > Do you desire to stop playing small in your life or business? > Do you want to get out of your own way and stop holding yourself back? > Do you desire to really learn from the best and take action now? > Do you want to attract more paying clients and customers to your business? > Do you want to learn from people who have made mistakes and come through the other side? > Do you want to feel empowered, motivated and increase your self-belief? > Are you ready to elevate and uplevel yourself into the world? > Do you desire to design your days and work on your terms? > Do you want to learn how to work on your mindset and be the best version of yourself daily? > Are you ready to show up and receive everything you desire? Then do yourself a favour........sign up for this series! It's going to be a GAME-CHANGER for you!! Entrepreneurs from the UK, USA, Australia, Czech Republic, Ireland, Canada and Jamaica are here for you sharing their knowledge and expertise to enable you to GET OUT OF YOUR OWN WAY and do the thing you want to do! (each interview is between 22mins-53mins so you'll receive over 16 hours of juicy goodness). ANDRENA PHILLIPS (USA) - Dynamic Master Life Coach, Strategist, Transformation Speaker, Published Author, CEO of KeepMovinWithAndrena LLC and SHE Winning Workshops. JULIAN SMITH (UK) - International Saxophone Musician featured on Britain's Got Talent. CEO of Julian Smith and travels the world with his music. ANESKA WIDE (SOUTH AFRICA) - Professional Network Marketer and Photography and Design. LATONYA THOMAS (USA) - Entrepreneur, Leader, Mentor, Public Speaker, Author. Owner & Chief Editor of Queen B Magazine. Founder of Sisterhood Network. LAUREN LINDSAY (UK) - Entrepreneur & Owner of Lauren Lindsay (Product based business). LORI STANCIL (USA) - MS Organisational Leader, International Life Coach, Speaker, Author, Minister & Entrepreneur. HELEN BOYLE (UK) - Bestselling Author, Entrepreneur & works in the Public Sector. LENKA KACLOVA (CZECH REPUBLIC) - Owner & CEO of Digital Marketing Agency in Prague. Affiliate & Online Network Marketer and International Brand. NATASHA GARNER (UK) - Photographer at Natasha Louise Garner. ROSANNE REID (JAMAICA) - CEO of Bee Free Marketing Company, International Radio Host, Bestselling Author & Speaker, Lifestyle Coach & Business Consultant, Founder of the BreakFree Exodus Conferences. CEO of her Retreat Business. ANNA PHILP (AUSTRALIA) - Actress (in many films), Model, Author, Business Owner, "Jaws Alert" app owner. JESS TESTAR (UK) - Professional Beauty Network Marketer, Avon Global Woman of the Week, Avon TV adverts & on the BBC. IAN REED (UK) - Army Veteran, CEO of The Formative Group (Global Company - security, close protection for prestigious clients, professional sports clubs, and many more). REGINA CRAYTON (USA) - CEO and Founder of Gina Inspires LA, Entrepreneur, Public Speaker and Published Author with a Microsoft Book Tour. Owner of Gina's Cuisine Cupcakes. NAOMI BURRELL (USA) - CEO & Founder of Be Inspired Global, Award winner of the Women In Business International Award, Journalist, Radio Show Host. DANNII MALEY (UK) - Owner & CEO of Dream Legend Leaders, Outlawpreneur and Leader. JULIE DICKENS (USA) - CEO & Owner of JDM School of Dance, Co-owner of Doodycalls, Professional Network Marketer. JESSICA SCHUURMAN (CANADA) - Editor of numerous #1 Bestselling books, Wellness Advocate. JAMES MALINS (UK) - Entrepreneur, Public Speaker & Mentality Coach. 8yrs+ experience of Sales, Marketing, Customer Service. LEAANN FULLER (USA) - Facilitator & Coach, #1 International Bestselling Author, Founder of Adopt-A-Mom for Christmas, Program Director for WBOC. GEMMA GILFOYLE (UK) - Certified Life Coach specialising in Anxiety & Depression, #1 International Bestselling Author, Blogger. LAKEISHA McGEE (USA) - Mentanoia Specialist, PhD Candidate, CEO of Rhift Consulting Firm, Coach, Licensed Minister. CARRIE WOOLLEY (UK) - Equine Horse Communicator, Entrepreneur & Horse Jewellery Designer. ALISON PLUMLEY (UK) - Commercial Cleaning for over 30yrs, Entrepreneur and sales for over 10yrs. EMMA JENKINS (UK) - Entrepreneur & Co-owner of Organically U (an organic health food online store focusing on vegan & eco friendly products). > 22-53mins of super advice and tips for your business. > Practical advice for your life. > Incredible lessons that each entrepreneur has learned along their journey. > Personal insight into how they overcame certain things in their life and business. > Content that will raise you up and elevate your self-belief and motivation. > Golden nuggets to implement and take action on both personally and professionally. 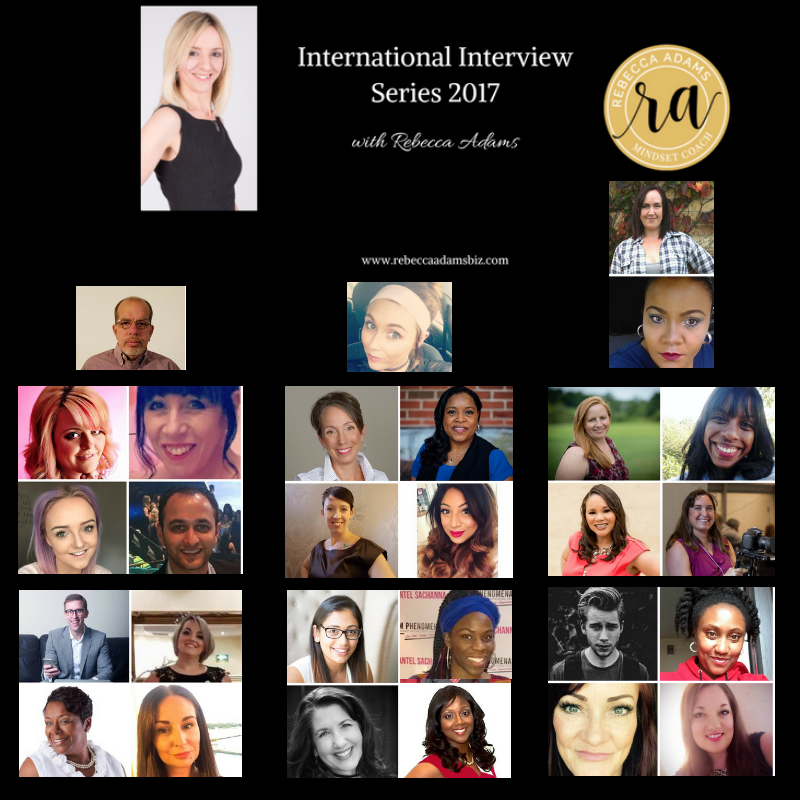 REBECCA ADAMS (UK) - International Life Mastery Mentor ™, Mindset & Business Coach, #1 International Bestselling Co-Author, Law Of Attraction Practitioner, Founder of the IGNITE Live Event, Army Veteran. LORI STANCIL (USA) - Life Coach, Speaker, Entrepreneur, Author, Minister. MANISHA PATEL (UK) - Jewellery Designer, Artist, Creative Entrepreneur, Makeup Artist. DR COZETTE WHITE (USA) - Finance & Tax Strategist, Writer, Bestselling Author, The Money Coach. LEAANN FULLER (USA) - Bestselling Author, Radio Show Host, Events Organiser. 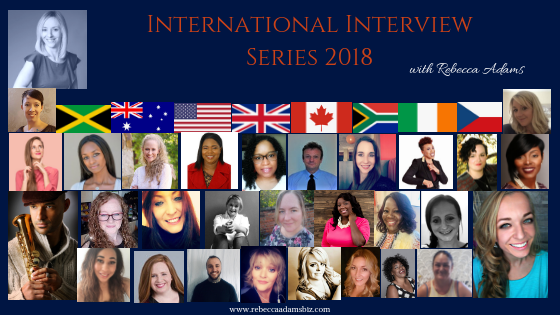 Interested in being on the INTERNATIONAL INTERVIEW SERIES 2019?